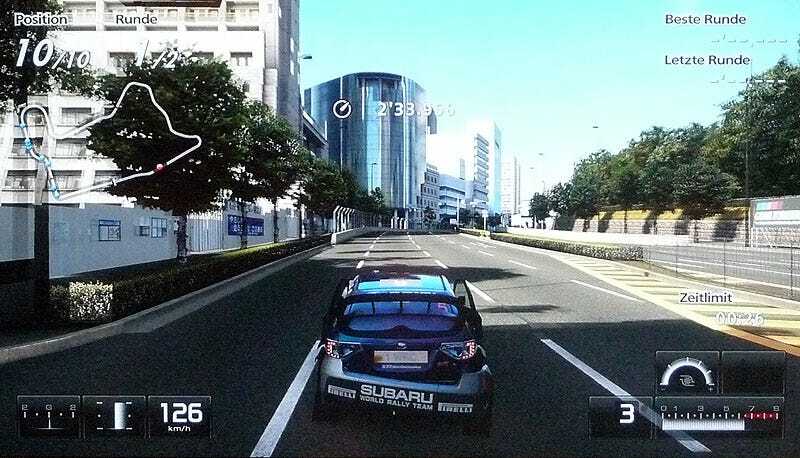 Sony had a playable version of Gran Turismo 5 at Gamescom, a brief and very limited demo that offered a look at one feature fans have been requesting for years—car damage. Well, we certainly damaged that Subaru Impreza. My technique for soliciting that damage was simply "drive as normal." That meant running into walls and opponents again and again. It wasn't long before my Subaru was looking worse for wear, but in an unusual fashion. There wasn't much in the way of scuffed paint or a dented chassis that I could see—and granted, we weren't offered an up close perspective. Instead, my car's bumper started to hang off, the doors wouldn't stay shut and the hood started to show the tiniest bit of battle damage. The Subaru's lights and sideview mirrors looked mostly unscathed. Granted, developer Polyphony Digital may not have included full damage system in the Gamescom demo, as the preview version was extremely limited in scope. The amount of havoc we did manage to wreak on our ride didn't appear to affect the handling all that much. Everything seemed mostly cosmetic. Speaking of, that Subaru was noticeably polished. Even the mudflaps and license plate looked to have been expertly waxed, reflecting the sunlight shining on the Tokyo track. That curious choice of surface reflection seemed to be another indication that the demo was likely not indicative of the final Gran Turismo 5 product. Fans excited about the possibility of car damage finally coming to the Gran Turismo series should check that excitement for now, at least until we see something more substantial. The core gameplay felt solid, just as solid as any of Polyphony's previous driving sim efforts. But it also felt familiar. With Tokyo Game Show just around the corner, we're hoping Polyphony has more to show us than a couple doors flopping about.